I went down to the Disney Exhibition at ACMI last weekend. As a child who was raised by Disney – largely by pirated video tapes my parents bought while we were living in Malaysia in the early 90s – it was pure heaven. Some of my happiest childhood memories involve Queensland summer storms, The Little Mermaid and my sisters and I rolling about 300 curry puffs to stock my mum’s freezer. The Brooding Architect has since informed me that this sort of activity is actually considered child exploitation in Australia. Anyway, in the spirit of Disney nostalgia, here is my recipe for curry puffs. It is very easy to make the curry puff filling, however rolling out the puffs is time consuming. I promise you though that the end result is well worth the effort. Since I don’t have any children I can coerce with Disney films, I ask (force) The Brooding Architect to help me. 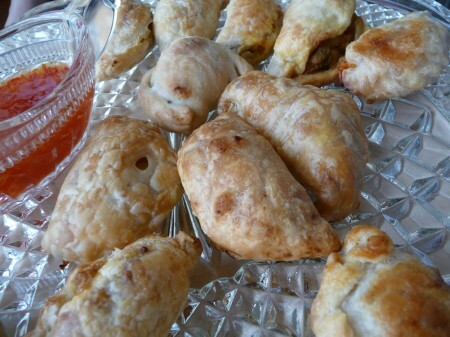 My recipe is for vegetarian curry puffs. However, you can also add 500 grams of pork or chicken mince to the mix to satisfy your inner carnivore. Step 4: Keep rolling for a long time. You have 80 of these things to make! Place the washed potatoes (with skin still on) in a large pot of cold water. Bring the pot to the boil and cook until the potatoes are tender. This should take about 20 minutes. Once cooked, drain the potatoes in a colander. Once cool enough to handle, use a small paring knife and peel off the skin. Cut each potato in half lenghtways and cut each half into 8 even sized pieces. In a separate large pot, heat the vegetable oil and sesame oil over medium heat. Add the diced onion and carrot and cook until soft. (You do not want the onion and carrot to turn brown, as this will result in a bitter taste). Add the garlic and ginger, cook until soft. (Again, you do not want the garlic and ginger to brown). Add the curry powder and, if using, the chillies. Stir constantly to ensure the onions, carrot, garlic and ginger are evenly coated and continue to stir for 1-2 minutes, until the curry powder becomes fragrant. 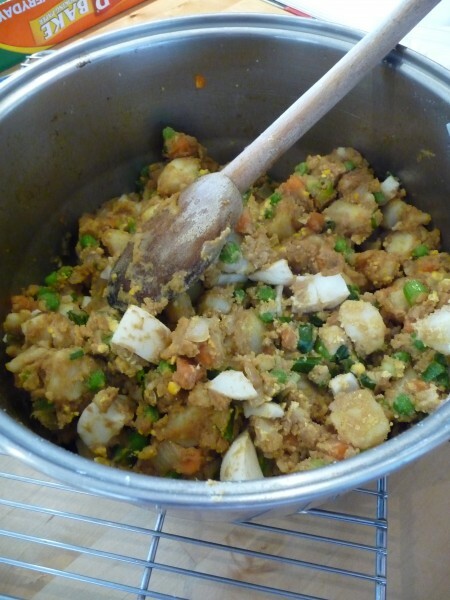 Add the diced potatoes, frozen peas, green shallots, hard boiled eggs, soy sauce, sugar, pepper and salt. Stir gently until the ingredients are evenly combined. 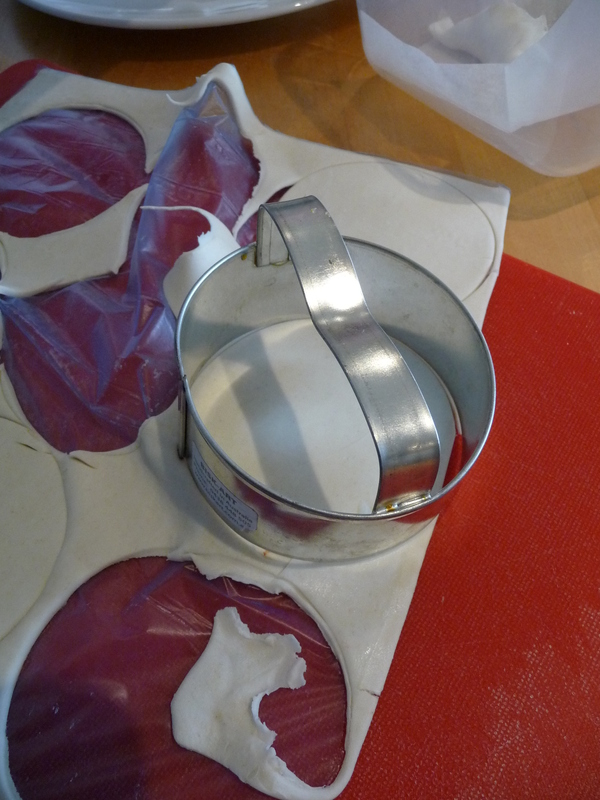 (You need to combine the mixture gently, as you don’t want to break up the hard boiled eggs too much). Put the filling aside until cool. Using a round cutter (I use a 6cm one), cut out circles of puff pastry. 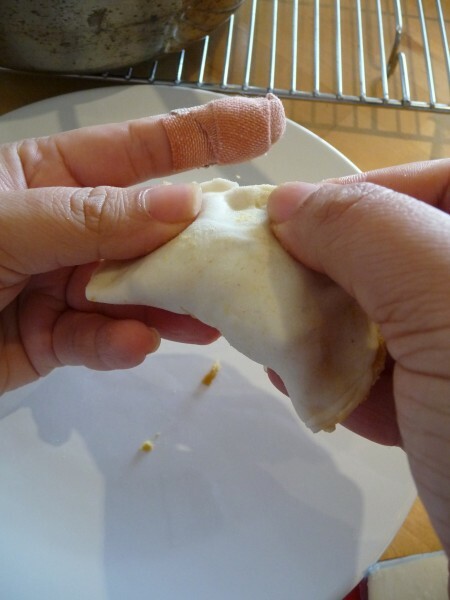 Place a Tablespoon of the filling in the centre of the puff pastry round, fold the pastry in half (forming a half moon shape) and crimp the edges of the pastry to seal the curry puff. Repeat the process until you have used up all of the filling. Pre-heat the oven to 200 degrees Celsius. Line a baking tray with greaseproof baking paper, space out a single layer of curry puffs on the baking tray. You will need to leave a small gap between each curry puff as the pasty will ‘puff up’ during baking. Using a pastry brush, lightly brush the top of each curry puff with a small amount of vegetable oil. Bake until golden brown – this will take about 20 to 25 minutes, depending on the size of your curry puffs. Remove from the oven, allow to cool in the baking tray for 5 minutes. Serve with sweet chilli sauce. 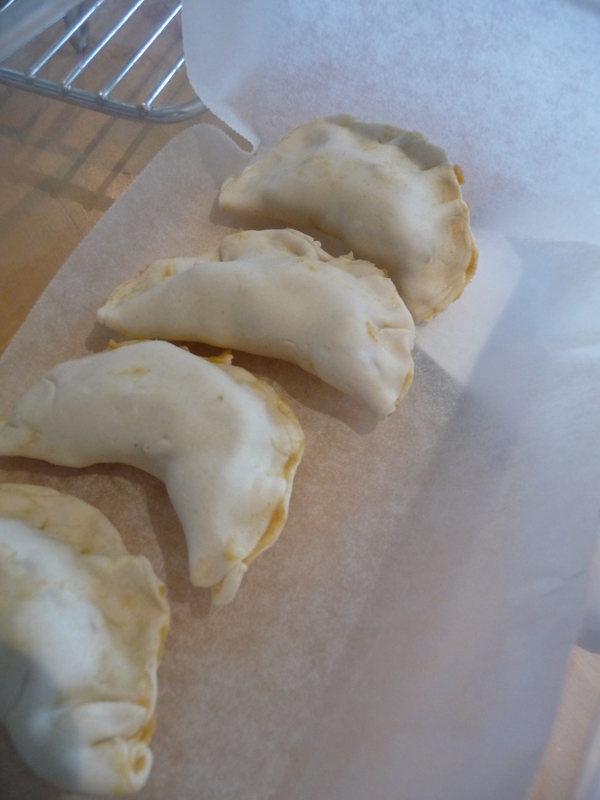 Any excess curry puffs can be frozen while still raw (that is, before you bake the pastry). 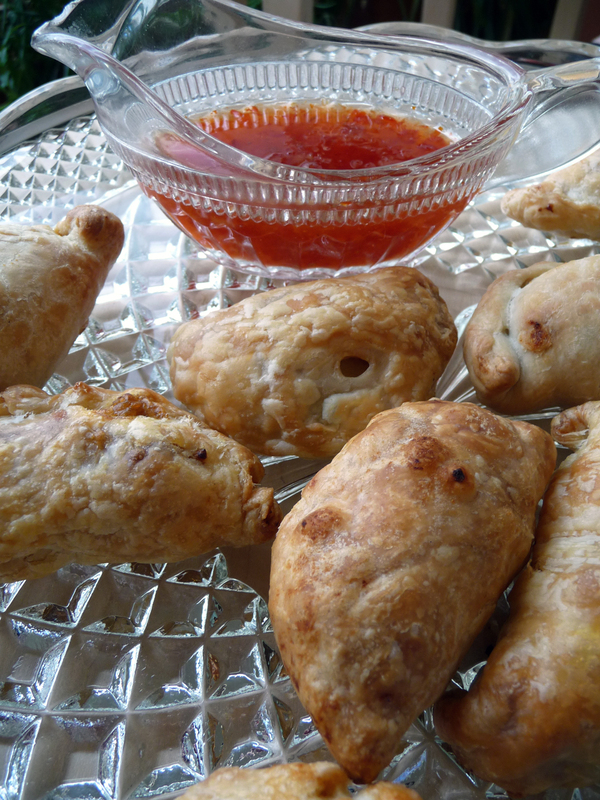 Frozen curry puffs can be placed straight into the oven from the freezer and will take around 35 minutes to bake. After a random internet search for recipes to wile away a couple of hours on a Sunday afternoon I stumbled upon your Curry Puffs recipe – and they were absolutely delicious! They brought back memories of my time living in Asia. I changed up your recipe slightly by adding 400gm of chicken mince to your vegetarian recipe above, used a little more curry powder and dark soy instead of light soy. Worked beautifully and made close to 80 curry puffs (there was a lot of pasty pinching going on!). I used Careme puff pastry (it’s a handmade pastry from the the Barossa Valley) and worth the splurge. Thanks for the recipe. Your Chocolate and Raisin cookies are next on my list!